Hulu Plus landed on the Wii at the start of the year and the company has now announced it’s arrived on the Wii U — utilizing the GamePad controller as a second screen so viewers can watch shows on their TV and view additional content, such as episode synopses, on the GamePad. TV content can also be streamed to the GamePad so the tablet-style controller can be used as a mobile screen to view TV as you move away from the big screen in your living room. A button in the bottom corner of the GamePad’s screen is used to toggle the view between the screens. 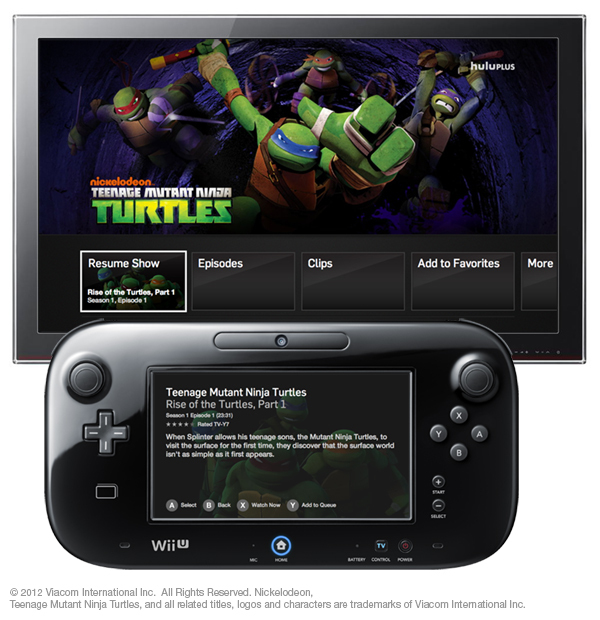 Hulu Plus content is accessible direct from the Wii U’s home screen. When scrolling and searching Hulu content the GamePad automatically updates to provide info about the shows and episodes. The GamePad can be used to start watching instantly or to queue up episodes for future viewing. Hulu said the Wii U will have a commercial-free Hulu Kids section — with more than 43 child-friendly shows on tap, including current season Nickelodeon programming.